On July 17th last year, the first open Jewish prayers in 50 years were offered on the Temple Mount as the holy site temporarily fell under the control of the Israeli police. 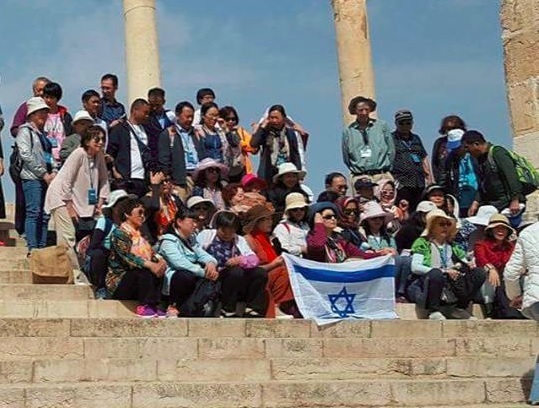 Now, just over one month away from Israel's 70th anniversary, the Israeli flag has flown over the Temple Mount—also for the first time in 50 years. Symbols like these are evidence that we are living in extraordinary and prophetic times. Not only does this testify that the fig tree has put forth its leaves and is ready for inspection by the LORD, but it also demonstrates that the gospel has now gone full circle, largely moving westward from Jerusalem and completely encircling the globe over a 2,000 year period of time. It has now reached every nation on earth and is back where it began. This is profound and monumental evidence that Jesus' appearing is absolutely imminent. Great post! All of this makes my heart rejoice with gladness! Our God is great and wonderful! This is incredible! Thank you for posting this, Gary! Like you said, it is amazing confirmation of the gospel coming full circle. I am so grateful that we are here to witness this! It is an honor to live in times like this! Praise be to the truth of our Bible. As we used to say in the Navy before we went home for good. We are so Short! Thank you for all your hard work on this site. Thank the Lord for leading me to it! Amen Mark Smith all thanks to God for guidance and love and bringing us all into existance and bringing our walk in life full circle and bringing us to this page and rev12 daily and many others as the body works together perfectly amen ! ...and at the same time the Russians are preparing their citizens for (nuclear??!) war with USA, check out http://www.thesechristiantimes.com/2018/04/14/wwiii-preparation-russia-prepares-citizens-for-nuclear-war-with-us/ we're going home soon, MARANATHA! I had hardly mentioned my thoughts above on the "Chinese element" when I checked the stevenmcollins.com website, and look what I found: "CHINA WANTS TO ALTER THE HOLY BIBLE"???! Annabel, the timing is certainly right! Wow! Sherry- Although I wish it were true about the Pope re-writing the Bible (I have not much good to say about the RCC), it is fake news. However, he DID say that one can't have a personal relationship with Jesus outside the RCC. Check both out for yourself. Joe....Could you provide a link to the popes stating one cant have a personal relationship with Jesus Christ outside the RCC? I thought I read that somewhere else, but can't find it. Thanks in advance! Joe....Never mind, I found it. That is pure blasphemy coming out of the pope. I saw it on youtube. And yes, pure blasphemy. By the way, this is my first time posting on Unsealed. I have been watching for about 8 months, and have read every thread here. This is the best source for end times information. Very exciting times we are living in! Joe Yahoo, I am glad you are here brother. Maranatha! In my humble opinion,there should be less celebrating and more preparing to help us spread the gospel in the few years we still have to do so. Amazing post thank you so much this had tears rolling from my eyes just amazing !! Maranatha !!! My mind only goes back to he who adds or subtracts. I was raised Catholic. The people are wonderful but the church is not nor was it ever 100% correct at any time. When you teach and discourage reading and undrstunding wow. Praise Jesus for the fact that everyone will soon know! I have prayed for the Lord to pour out his spirit. This group must have been standing right under it. Love reading the articles and the opinions and seeing and hearing people comforting they're brothers sisters and mother's. Mark Smith exactly right. Just visited my parents for my Dad's 80th birthday and had a rather "spirited" discussion about the RCC; people like my parents are very sincere and good people, the RCC leadership not so much. Even done in a loving way, it's very hard on the older folks when they hear the truth from family. It's infuriating to see how the RCC has manufactured things to further their agenda at the expense of innocents. Since we are talking about what is happening on the temple mount, the following reminded me of Ezekiel 37! What's interesting to me is after Ezekiel 37,38,39 is chapter 40. I haven't studied it yet, but wondering if anyone has took measurements of the temple mount and compared them with scripture? The Israeli flag represents the GOVERNMENT of Israel. I'm hoping someone can explain how the GOVERNMENT of Israel...pro-abortion, pro-LGBT...represents ISRAEL. Speaking of which...Israel Folau - a very famous Australia rugby player - has been in the news all over the place regarding his comment that homosexuals will go to hell unless they repent and turn to God. May be all to get the real Israel's attention! Creating a lot of division here in NZ and Australia however which is awesome. Gotta get Gods word out, regardless of the backlash by society. Well, let's hope the individual Israel Folau is all safe and sealed by faith in Jesus Christ John 3:3 because if not he will share the same judgement of those he raves against... MARANATHA!